These are CDs or DVDs which we will ship to you if you reside in one of the 50 United States. We do not ship outside of the US. Perhaps you would like to purchase a download version of the music which is sent via the Internet to any country with Internet access. Free Shipping on all orders. Your CDs will ship via USPS within two business days of our receiving your order. Please verify your shipping address at Paypal when you place your order. If you wish to purchase downloads, click here. We have begun changing from plastic CD cases to cardboard. Did you realize that all of those old CD cases can't even be recycled at most facilities? From now on we will be using recycled cardboard and ink that is biodegradable. The songs will be the same, but we will do our part in reducing land fills. Lyrics are now available from the main menu on the home page. This is Dr. Jean's second DVD with videos of her songs. The package has 20 videos with songs. I asked for your input on what songs you’d like to see on this video. It’s almost like the Best of Dr. Jean with “Tooty Ta,” “The Cool Bear Hunt,” “My Mother Is a Baker,” and “Pizza Hut.” I tried to choose songs that are very interactive and have a lot of movement to help release wiggles. The songs are organized for morning meeting, math, literacy, “just for fun,” and good-bye. This is Dr. Jean's new double CD set for 2012. The package has 28 songs and instrumentals to encourage your students to get up, move and learn! Take a look at these titles:. There are a total of 5 music tracks, 28 with vocals and 28 with instrumentals. For more information, click here. This is Dr. Jean's double CD set for 2011. 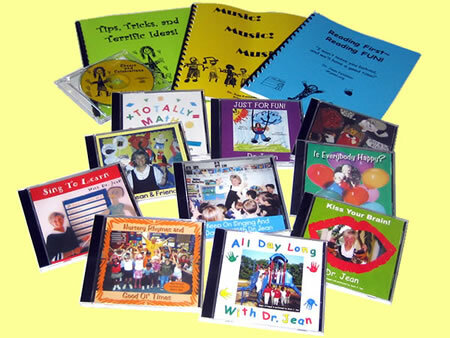 Songs to help students improve their language skills are on both CDs. There are a total of 52 music tracks, 26 with English lyrics and 26 with Spanish lyrics. For more information, click here. This is Dr. Jean's DVD for 2010. Dr. Jean's videos on this DVD will demonstrate the movements to accompany the songs on her new CD set. The DVD includes all the vocals for the 28 songs. This music is dedicated to getting children to MOVE! And the secret is to make it so much FUN they won�t realize it�s exercise. Click here to see a sample video on youtube. For more information, click here. This is Dr. Jean's double CD set for 2010. This music is dedicated to getting children to MOVE! And the secret is to make it so much FUN they won�t realize it�s exercise. There are a total of 56 music tracks, 28 vocals and 28 instrumentals for each of the titles, too. For more information, click here. This is Dr. Jean's new CD for 2009. This collection of new songs, with lyrics by Dr. Holly, offers music for Environmental Studies, Science and Social Studies. For more information, click here. This CD set was issued in 2007. The goal of this CD set is to put a little FUN and JOY back into reading. I hope your children will be so engaged singing and dancing that they won't even realize that they are learning! Click here. This is one of Dr. Jean's two-CD sets and words are included. You will find songs for all four seasons. For more information, click here. Here are some of the 22 titles on the CD: If you love the Lord, clap your hands, Do Lord, Down in my heart (Joy), This Little Light of Mine, Rise and Shine, and I'll be a sunbeam.